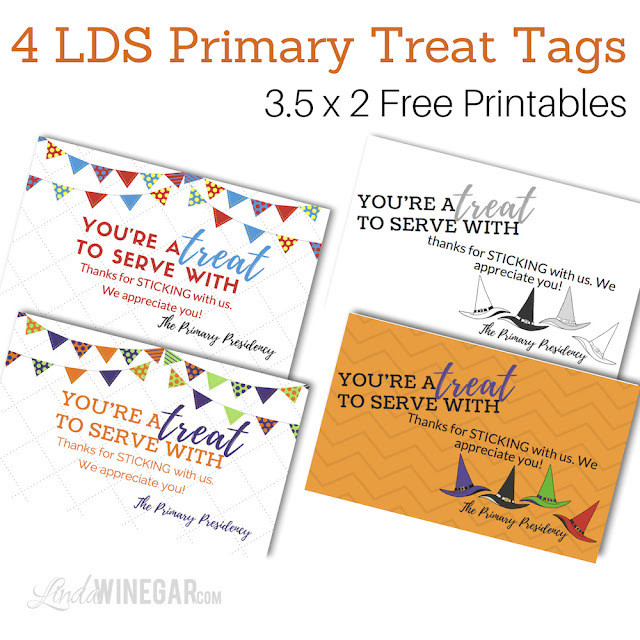 4 LDS Primary Teacher Tags from the Primary Presidency! I love it when friends ask me to design things to help them with their responsibilities or maybe even just crazy awesome ideas they might get. It's why I exist! LOL ok I suppose I exist for other reasons BUT these reasons sure make life super fun for me because I love this stuff. So, ask me ok!!! 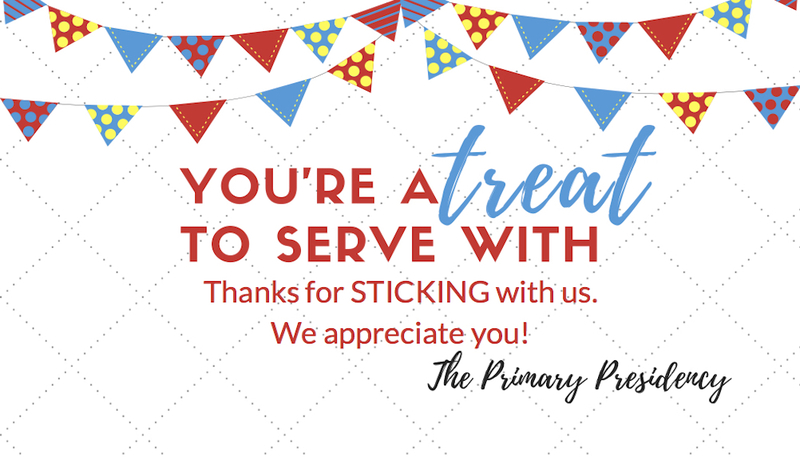 I especially love helping peeps with their responsibilities which help others feel loved, appreciated or help others come unto Christ, those are my ultimate fave. So one of my besties Heidi (our Primary Pres) asked me to design a tag for treats which her amazing counselor (another other bestie Mindy) was making for the primary teachers in our ward. Great idea huh?! I designed the first one in like 5 minutes using Primary Colors (Red, Yellow & Blue) because our local copy shop CopyTec was closing @ 5pm, and I had totally not realized that, and had procrastinated designing it because I was doing other things. I forget literally every time I need to get something printed on a Saturday that they close at 5pm (this is why I need to own my own copy shop!). They were awesome enough to stay open and print my tags because I got there at like 5:04pm. PHEW! They are so great! Here they are FREE for you to use! I designed bonus Halloween ones because well, I had more time afterward and figured it's October. (picture the fun Halloween emojis here!) 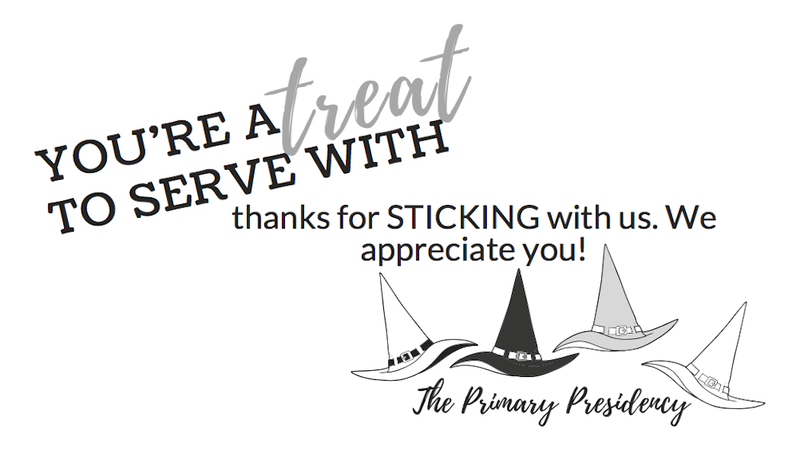 Aren't those Witch hats the cutest?! 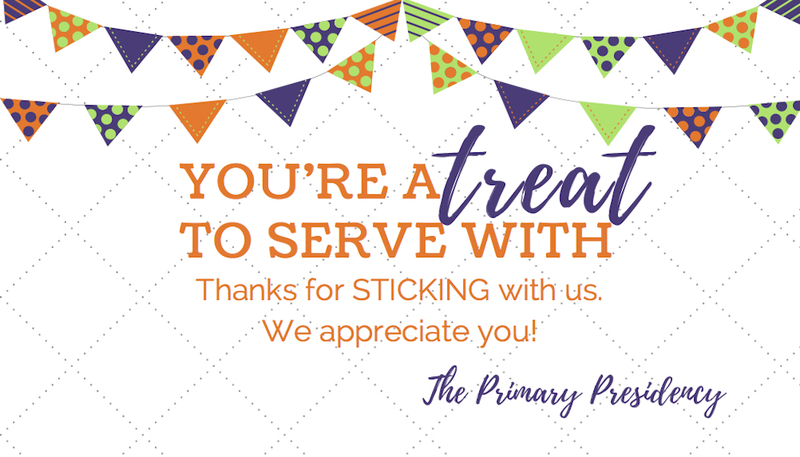 One for each of the members of the Primary Presidency. 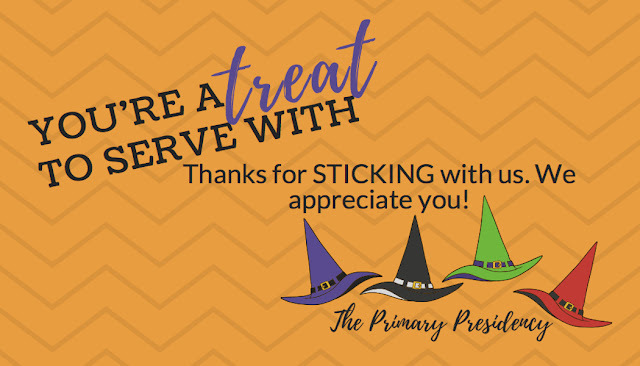 Not that they are mean witches but because the way they serve 150+ kids (including 2 of my own rowdiest kids) seems like they must be doing some kind of magic in there to teach them about Jesus and love them like Jesus loves them. They turned out cuter than I thought they would. It must be the rice krispie treats making them look super awesome and delish! Each is 3.5" x 2" (business card size) when printing them, just select you want multiples on a page, you can do 10 to a page or less, and print them on Sticker Paper for quick and easy treat tags, which you cut out and stick on your treats, OR print on cardstock and cut them out and punch a hole and put ribbon through it. Your choice! Click on the images below and then save the ones you want. This one is just Black and White if you're like me and don't have a color printer at home.